Who said camp is just for kids? Across Maine, most youngsters have packed their trunks, said good-bye to their fellow campers, and returned home to family and friends and preparations for school. Counselors, too, are getting ready for their fall activities – school or college or jobs. But the pleasure and enjoyment of camp activities endure at many camps, specifically at family camp programs. These programs host children, to be sure, but they also make camp fun available to adults. 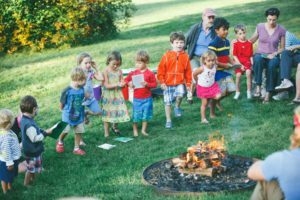 Touting rustic accommodations, three meals a day, and an array of camp activities – ranging from weaving to paddle boarding to archery – Maine camps for decades have shared the fun of a camp experience with kids of all ages. It’s five p.m. and overcast at Camp Arcadia in Otisfield. More than eighty family campers spanning three generations are wandering toward the porch of the dining hall where staff members have assembled hot hors d’oeuvres and a variety of beverages for the pre-dinner social hour. Young children scramble over logs and rocks, find seats next to their parents, nibble from their plates of snacks. It’s the second evening of Camp Arcadia Family Camp, now in its 43rd summer. Family Camp Director Holly Graham wears countless hats in overseeing the program. She says families – sometimes alumnae who want to bring their own young children to camp – often consult with each other to determine which week to come. Family camp may be the only time these families see one another, she says. The experience has become tradition for them. A benefit of the family camp experience is that programming can serve a broad age range, an advantage over some vacations. It’s also a way of extending the camp season, says Camp Arcadia Director Louise Fritts Johnson. This week, all the camp’s housing facilities are in use, and a staff of about 20 is on board to guide and teach activities. Camp Arcadia’s family camp provides a children’s program during its first week as well. Structured morning and afternoon children’s activities offer kids a variety of adventures and free up parents for their own fun. Eight years later, Miller’s kids are 14 and 11, and “they still love it as much now as they did then,” she says. Miller says her friends at Camp Arcadia are her best friends, even though she sees them only once a year. She remarried in June, and when she and her husband John arrived at camp this week, their cabin was decorated by those friends. “This is a way for us to vacation in a way for grown-ups to be campers, too,” Miller says. Often alumnae want to bring their own children to family camp. Jonson’s two daughters are now Camp Arcadia campers, but family camp is still integral to their summer experience. “Basically, they get off the camp bus and we come back up here,” Jonson says. Jonson’s son attends Netop Summer Camp in Casco. “It works great. We’re teaching all the activities,” Kissack says. Two clear benefits to a family camp experience are that programming can serve a broad age range, an advantage over some vacations. “The other thing that’s cool is that everything’s taken care of you,” Kissack says. And families form friendships, he says. Like at Camp Arcadia, Kingsley Pines family camp participants often schedule their visits to coincide with that of friends. Summer camp appeals to youngsters for many reasons such as – friends, skill building, rigorous activity and nature. Outside the dining room windows at Camp Arcadia Tuesday evening a dozen kids of all ages mingled in a group, watching a pre-teen girl pull herself up the tetherball pole. Another collection of youngsters walked along a short stonewall like a balance beam. Louise Johnson says the wall has universal appeal, year after year. It’s not unlike family camp in general. Catriona Sangster, director of Camp Wawenock in Raymond, says the camp’s annual family-work event has drawn attendees for decades. Unlike family camps offering strictly vacation opportunities, Camp Wawenock enlists help with projects in the morning, then provides use of camp facilities in the afternoon. Sangster says the minimal cost is charged simply to cover food expenses. Sangster says the tradition began in the 1940s, when the owner had health issues and her brother brought colleagues to help close up camp. A tradition was born. From helping with laundry – wool blankets that must be hung dry – to bringing in the pier, to cutting brush, participants help lighten the burden of post-camp demands, Sangster says. Coinciding with family-work week is Camp Wawenock’s “Special Girl Weekend” to be held Friday through Sunday. Sangster says 10 girls, mostly pre-camp age, will come with their camp alumnae mother or grandmother “to have fun.” Family campers will join them in evening activities. Family camp participants often schedule their visits to coincide with that of friends. 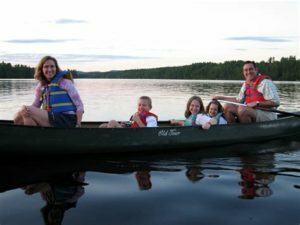 In Washington, Maine, Medomak Family Camp is committed solely to providing families with a camp experience. For eight weeks each summer the camp offers one-week sessions with a vast array of activities – land and water sports, arts and crafts, nightly campfires and stargazing. Hosting a maximum of 12 families per week, the camp encourages building friendships, enjoying traditional camp activities, and relaxing in an everything-included environment. Each morning campers are grouped by age, from pre-school to adult, with varied programming for all. Afternoons offer family together time, again with the chance to play and relax. Medomak Family Camp Executive Director David Brunner says the camp appeals to people “who love camp.” That includes adults who attended camp as kids, as well as adults who never had the chance. “It’s wholesome. It’s a throwback. It’s the kind of vacation people feel good about taking,” Brunner says. A staff of 35, individuals Brunner calls “specialists” serve as activity leaders and instructors. Because the camp doesn’t need cabin counselors, a smaller staff can support the facilities’ programming, he says. Brunner says campers want benefits like those of kids’ camp: “the activity, spirit, fun, laughter, friendships, and community.” But as adults enjoying treasured vacation time – and the need to “decompress and rejuvenate” – they need a few creature comforts, he says. Cabins have “real beds,” as well as private bathrooms and showers. Brunner, who says about 95 percent of campers come from outside Maine, says Medomak Family Camp has found its niche. From its founding in the mid-90s to a facility that today offers both family camp and a retreat center, clientele return year after year, he says. Summer camp appeals to youngsters for all sorts of reasons – friends, skill-building, and rigorous activity and relaxation in nature. Family camp presents a nearly identical appeal. 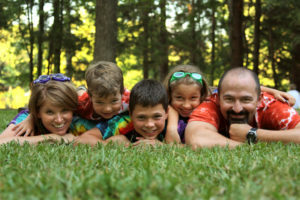 Medomak Family Camp welcomes families all summer. 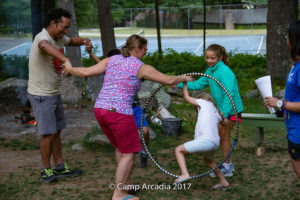 Camp Arcadia, Kingsley Pines Camp, and Camp Wawenock – and many other Maine youth camps – open their doors to campers of all ages, too. They offer rejuvenation in Maine’s natural beauty, abundant opportunities for fun and rest, and time in the wondrous, inimitable world of camp.